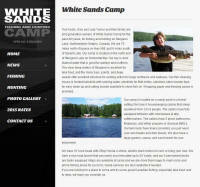 Here at White Sands Camp, we’ve got some of the best fishing around. Located on the north end of Sturgeon Lake on Horizontal Bay, we provide multiple unique fishing experiences. The bay itself with its dark, stained water is ideal for walleye and northern pike. If you prefer the excitement of lake trout, the azure waters of Sturgeon Lake are home to this fisher’s favorite. We also provide a fish-cleaning house right by the lake with stainless-steel counters, running water and electrical hookups available. Gary and Judy Turner, the second-generation owners have tones worth of knowledge about the area, where to find the best fishing, and we also offer guided excursions where you can get the expertise that only our years of experience can provide. With boats available for rent, a boat launch that will accommodate vessels up to 24’, and we also offer two hydro-docks for those who prefer to bring their own craft. Our idyllic camp is located six miles south of Savant Lake and seventy-two miles north of Ignace on Highway 599. Come join us and make your next vacation a relaxing adventure that you’ll be talking about for a long time to come. Anderson's Lodge is committed to giving you a quality fishing vacation! You have the choice of fishing on 9 different lakes including Legendary Lac Seul and for 5 different species: Walleye, Northern Pike, Smallmouth Bass, Muskie and Lake Trout. Choose from custom-built 21’ Stanley Bowriders or 16’ Lunds, either way the fishing is fast and furious. Featuring all-inclusive American Plan or Remote Fly-In Packages from 3 days to a full week giving you the flexibility for your vacation needs. Enjoy friendly, professional service in clean, first-class accommodations. We will take care of everything on your trip so all you have to worry about is setting the hook! Do it right the first time, call us toll-free today to book your ultimate fishing vacation at 1-800-465-1098. Cozy Camp is just that! A small, clean & cozy family owned & operated "hot spot" to fish on the famous English River. We can help you make your fishing vacation as relaxed or as adventurous as you want to get! Located just 20 miles north of Ignace, Cozy Camp is the only resort on 32 miles of gently flowing waterways interconnecting many lakes with the English River. You can enjoy the fresh clean air & the pristine beauty of the river from the deck of your fully equipped modern housekeeping cabin. It is quite easy to catch a tasty walleye dinner only minutes from camp. Aggressive northern pike will often lock on to your walleye while reeling in, giving you an opportunity to net both! Running into a school of quality sized small mouth bass will keep both young & old anglers busy for hours! Our area in Northwestern Ontario offers exceptional opportunities for hunting. We pride our selves with having an extremely high success rate for our fall Black Bear Hunts. Resident Moose hunters find the woods simply full of ruffed grouse. While hunting the river you may see flocks of migratory birds drawn to the miles of natural wild rice beds. You can combine your hunt with some of the best fall fishing around! Whether you rent one of our cozy cabins or an R.V. site, our customers satisfaction is our first priority! This truly is "North of the Tension Zone"! 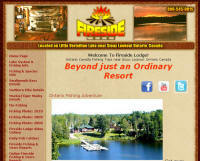 Fireside Lodge, located in Northwest Ontario, Canada, near Sioux Lookout is the only lodge located on a 10-lake system. We offer a Canadian Wilderness Fishing Adventure with "Fabulous" fishing for Smallmouth Bass, Northern Pike, Tiger Musky, & Muskie. Fireside Lodge accommodations are either lodge rooms in a historic lodge building, or newly built individual lake front cabins. All equipment is up to date and dependable, featuring 16 ft Lund boats with floors, swivel seats, new Yamaha motors, landing nets, and all safety equipment supplied. Upgrade boats are also available. Upon arrival you receive a full lake and equipment orientation including lake maps. Throughout your stay you will receive daily fishing instruction. Our full service package is designed to give you a relaxing vacation where we take care of all the details, including outstanding meals, and you simply enjoy. Our setting provides seclusion, wildlife viewing, boreal forest excursions, canoeing/kayak opportunities, and the silent sport of connecting with the wilderness. Come enjoy this wonderful "Canadian Wilderness Fishing Adventure" where Moose and Bear roam the bush, Bald Eagles and Osprey fly the skies, and the call of the Loon puts you to sleep at night. Come see this great outdoor show at Fireside Lodge. With four lakes to choose from, Northumbrian Resort is your destination for fly-in fishing in northern Ontario! Arc Lake boasts a wide variety of species for you to try and reel in, like lake trout, smallmouth bass, and trophy walleye and northern pike! Carling Lake is teeming with pickerel, northern pike and lake trout. Minnitaki Lake is overflowing with species — including the previously mentioned, try to catch perch, whitefish and muskie. Last but not least, hit the waters of Taper Lake to chase after nine-pound walleye and northern pike that tips the scales. Every lake has its own accommodations, so choose wisely! From fully equipped, private cottages to eight-person cabins, you’ll be able to find the lodging that’s right for you. Bring your friends and family — we can accommodate groups of up to eighteen people! We have tons of amenities, including boat rentals and gas, trailer park and tenting areas, and family friendly amusement! We also offer other outdoor adventures to choose from, so come up north with us and enjoy them all with us this year. See the best of what Mother Nature has in store for you with Wilderness Air Escapes! We’ll take you to Vermillion Bay and our exclusive areas; with acres of forest to hunt in and over 25 lakes to fish in, you’ll have the trip of a lifetime with us. Experience the best of nature by day and retire to one of our cozy, fully equipped cabins at night, including running water and showers. For groups and families alike, we’ll get you set up and take care of every little detail, so you can focus on your trophy or your catch. Come see us for your Fishing Trip in Canada!